Learn more about what is going on with your association and your industry by exploring the links below. 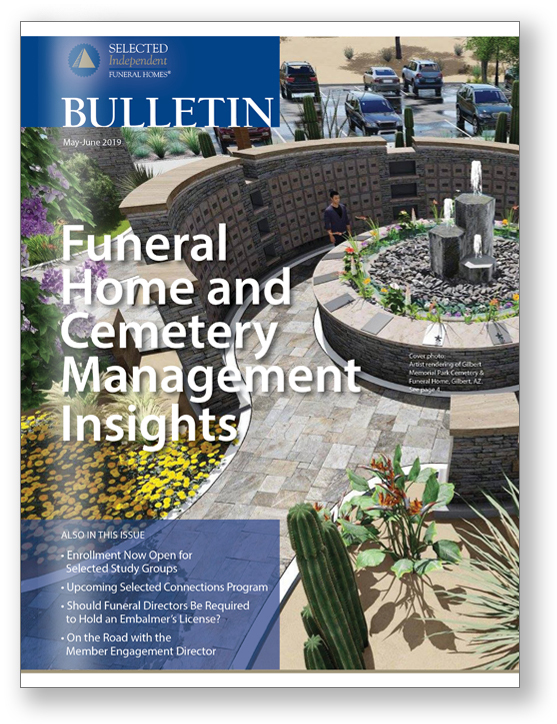 The Bulletin - The bimonthly news magazine for members and friends of Selected Independent Funeral Homes. Press Releases - Press releases and news from the association to its members and the public. Obituaries - Remembering those within our association who recently have died. New Members - Find out who has recently joined Selected. We always appreciate receiving news and information relative to the funeral service profession that would benefit our members. If you have material you would like to submit for possible publication in The Bulletin and/or on this website, please contact Selected at 800-323-4219 or member-news@sifh.org.